Media players are a mostly confusing breed at the moment, especially for the neophyte. The two biggest names haven’t even been released yet; that’d be the Boxee Box (basically a small box that uses Boxee’s excellent software, long available on Mac and PC) and Google TV, both due out sometime in the fall, probably. So at the moment you can either use a home theater PC, which is expensive and not particularly easy for beginners, or you can opt for one of several media players. These media players generally hook up to your network (either wired or wireless) and can stream video, audio, and photos from any computer on the network to the TV. They’ll also probably have a USB port so you can plug in a hard drive or USB flash drive. 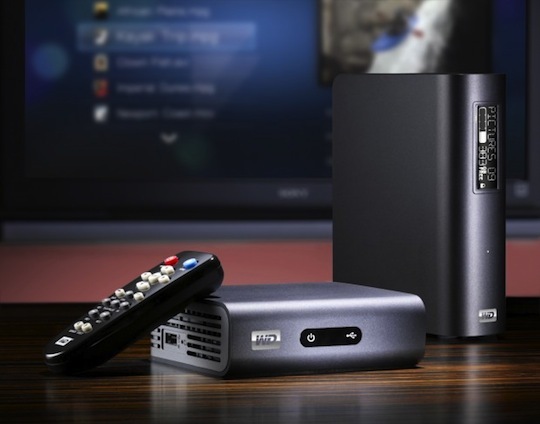 The two leads in the media player market are the Syabas Popcorn Hour line and Western Digital’s WD TV Live line. The Popcorn Hour is also an expert device–it has a built-in Bit Torrent client, for God’s sake–and its interface and complexity are too much for a neophyte to handle. The WD TV Live Plus, the newest version of Western Digital’s WD TV Live line, is a very solid option for getting digital content onto a TV. Its interface is fairly easy to use, it supports just about every format you’d need, and the updated Live Plus fixes every problem users had with the last version, namely some wonkiness with ripped DVD menus. The best part? It now supports Netflix as well as content streamed from the network or via local USB. It’s a great alternative to, say, the Roku HD box. The Roku is $100, $50 less than the WD TV Live Plus, but you’re getting so much for that $50, especially if you’ve got a lot of video (even high-def video like those delightful .MKV movies harvested online). It’s definitely worth the extra cash. The WD TV Live Plus media player is available now from WD for $150.